Need to create diagrams, flowcharts, circuits, or other kinds of entity-relationship models? Microsoft Visio is without a doubt the best software for that, but that doesn’t mean it’s the best choice for you. Visio may be the industry standard in the corporate world, but it comes with a huge drawback: it’s expensive ($299 for the standard version as of this writing). Can’t afford that? Then you ‘ll be happy to know that several open source alternatives exist for the low, low price of FREE. We’re going to highlight the two best ones here, but if you don’t like them for whatever reason, you can scroll down to the bottom of the article for even more options to explore. You’ll be able to create your first diagram in mere minutes. Drag-and-drop a few symbols onto the canvas, then connect them using the various types available in the toolbox: lines, zigzags, arcs, circles, curves, etc. Dia also supports layers, making it a lot easier to manage complex charts, and moving elements between layers is as simple as hitting a hotkey. Snap to grid, easy resizing, text labels, image insertions – Dia has it all. Anything you can do in Visio can be done in Dia as well. The only real downside is that Dia can’t open Visio VSD files, but it can handle most other diagramming formats like XML, EPS, and SVG. Have you heard of LibreOffice? As far as open source competitors to Microsoft Office go, you won’t find a more solid and robust alternative. LibreOffice is far from perfect, but it’s a respectable option for fans of open source software. The app that should interest you is LibreOffice Draw, the Visio counterpart in this office suite. 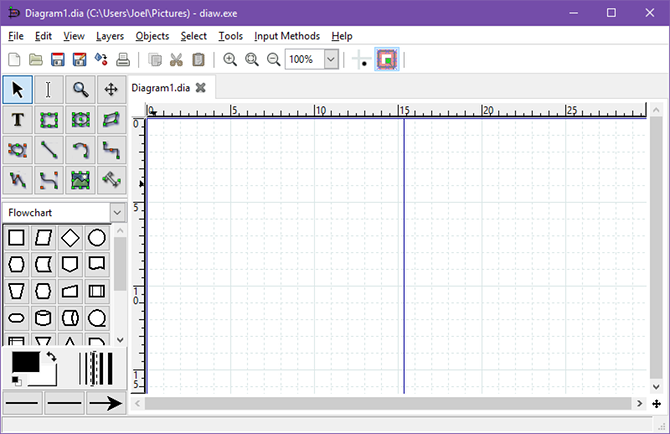 LibreOffice Draw supplies two things for you: shapes and lines. You use the shapes to represent diagram entities, and you use the lines to connect them according to the entity relationships. It’s perfect for creating flowcharts, but you can do more with it if you want (like desktop publishing or PDF editing). First you have to open the Drawing toolbar, which you can do through View > Toolbars > Drawing. Grid snapping is on by default, but you’ll want to change the snapping sensitivity by going to Tools > Options, navigate to LibreOffice Draw > Grid, change the values under Resolution to your intended grid size, and change the values under Subdivision to 1. LibreOffice is surprisingly easy to use once it’s set up properly. You can draw shapes, connectors, lines, curves, symbols, arrows, thought bubbles, and even 3D objects. 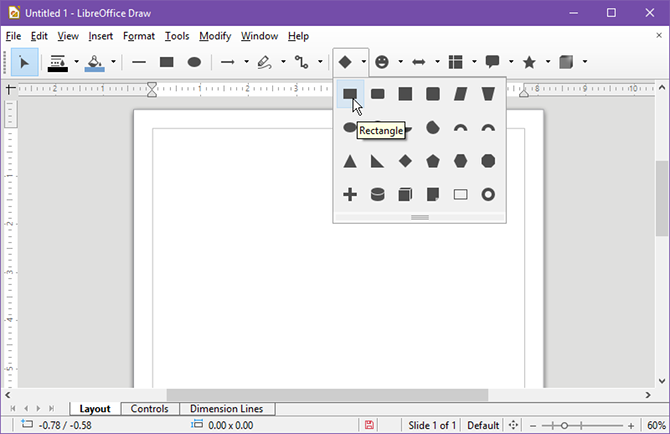 If you’re already using LibreOffice as your main office suite, forget Dia and learn to use Draw instead. The learning curve isn’t much worse at all, and you can use it for more than just diagrams. Dia and Draw may be the best available right now, but a quick web search will turn up plenty of competitors that are just as good in many ways. Keep in mind that these are NOT open source unless specifically noted in the description. yEd Graph Editor - Very similar to Dia, except much more powerful and proportionally harder to use. It has an automatic layout feature that can instantly rearrange a diagram to be clutter-free and more readable, which is fantastic for big and complex flowcharts. LucidChart - A very solid alternative to Visio in a lot of ways. It’s web-based, so you can access it from anywhere, and packed full of features that make diagramming easy. draw.io - A no-login-required web-based diagramming tool that may not be the slickest in appearance, but can certainly get the job done. Diagrams can be saved to Dropbox, Google Drive, OneDrive, or locally. The interface is clean, the results are acceptable, and it’s open source.